This is a cross-post from a forum I frequent, Intangibility. A lot of the stuff here is commonplace wisdom among the folks likely reading this blog, but I figure it's worthwhile for me to get my thoughts out on this, if nothing else. So over on RPGnet someone posted a question about how to make exploration exciting and fun in RPGs. I've been having some good luck with this in the Hill Cantons (~2 years now, forth the Nefarious Nine!) so I thought I'd start the ball rolling on a parallel discussion here. Chris has a few thoughts here and here. a) Having a coherent theme/themes. It's important to have dungeons that are not only weird and fantastic, but also have a structure and logic to them. 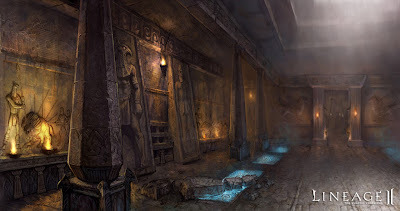 Being able to determine things about the dungeon from your surroundings helps fix the environment together and provide ideas for what else can be around, driving exploration efforts. b) Using random encounters to provide time pressure. This means that choices have a significance to them because the longer you take to explore, the more dangerous the site becomes. a) Provide options. In contrast to the dungeon, where you're navigating a presumably utterly unknown environment, I think wilderness exploration benefits from having known landmarks as guideposts to provide immediate areas of choice. The dungeon provides a series of constrained options ("doors are north, south, and the trap door in the corner leading down") but the wilderness is wide open. Give players a map and let them know what the major things around them are! Those options serve as the initial "dungeon doors" of exploration, providing the option for players to set goals and formulate plans. But remember Korzybski here: the map is not the territory. Toss in curveballs, make the map inaccurate (maybe let the players know beforehand that it may be inaccurate!) and add in things that the mapmaker may not have known about. b) Provide for altering the wilderness. In the HC, we're in a pseudo-domain-game stage, which requires clearing and holding hexes (exploring to make sure they're safe for regular folks, then establishing control over them through patrols), giving us an opportunity and incentive to interact with the environment. a) Recognize that you're going to create and prep areas which may not see the light of day. THAT IS OK. Part of exploration means that you're likely going to miss things. All of these are centered around making exploration contain meaningful choices. Someone on the RPGnet thread suggested that exploration is like a slot machine hit. I think it ought to be more like a hand of poker or blackjack; a slot machine is completely random, but blackjack and poker both require the application of skill along with the randomness to provide an (arguably) more compelling experience. Chance should most certainly play a role, but exploration should also make use of player agency and decisions.